The 3503 track excavator offers one of the smoothest and most powerful hydraulic systems available on the market today in this class. 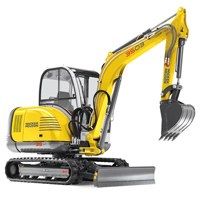 This 3.5-ton excavator is available in a canopy or full cab version, each with a choice of short and long dipperstick. 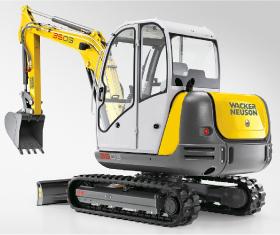 Powered by the economical Yanmar 4-cylinder diesel engine, the 3503 track excavator offers rubber track, dozer blade and boom mounted working light all standard. The X-shaped undercarriage provides for greater lifting power and stability. Dipper stick mounted auxiliary hydraulic connection for two directions of motion and a control pattern change system. Standard boom mounted working light for optimum working conditions.